Can This Monster Bank Rise Above Its 52-Week High? Shares of banking powerhouse Wells Fargo reached a 52-week high on Monday. Let's take a look at how it got here to find out if the company's stock price can grow even higher. The immediate spur to Wells Fargo's market price was last week's bank stress test results from the Federal Reserve. To everyone's relief, 17 of the 18 test subjects passed, some quite easily. Wells was safely within that 17 (in case you hadn't heard and were wondering, by the way, the one failure was Ally Financial). The passers even included the klutzy incumbents Bank of America and Citigroup, both of whom continue to have their share of problems after emerging from last decade's financial crisis. The tests assumed plenty of stress -- the key figures the Fed used for its worst-case scenario were an average 4% cratering of real GDP this year, unemployment pole-vaulting over 12% by Q2 2014, and home prices losing 20% of their value in the next two years. That's not an easy exam to pass, and the fact that nearly all banks made the grade has lifted bullish feeling for the sector as a whole. It's also provided a jolt to the stock prices of nearly every winner.B of A, Citi, and Wells have all jumped past the S&P 500 from just before the tests till now. As have fellow big gun JPMorgan Chase and -- let's pick a solid representative among the regional players -- BB&T . Nearly all of these stocks are, like Wells, teasing their one-year highs(save for BB&T, which is still a few bucks short of its $34.37 peak ). Yes, even B of A and Citi, who suffer from an apparently chronic shortage of investor love, have traded up recently. Beating the stress test was the most recent in a series of nice wins for Wells Fargo. Since the comeback of the housing market, the company has been driving ahead on the fuel of mortgages. It is, famously, far and away the top housing lender in the country, holding about one-third of the market -- and boy, is that market big. And growing. On a quarter-over-quarter basis alone in its 4Q, Wells Fargo's mortgage originations leaped 35%. This helped the bank break its records for net profit -- in both the quarter and the full year. For the former, revenue grew 7% on a year-over-year basis to nearly $22 billion, while the bottom line advanced a sweet 24% to $5.1 billion ($0.91 diluted EPS, almost needless to say, another all-time high). The full-year tally was $86.1 billion in top line (6% better than 2011's result), and a net that popped 19% higher to $18.9 billion ($3.36 diluted EPS). Not all of Wells' numbers are so impressive; in spite of the low-rate times we live in, investors would probably be cheered by a higher net interest margin. That important number came in at 3.56% in Q4, 10 basis points below the previous quarter and weaker than the 3.89% of 4Q 2011. It was also down for the full year, dropping to 3.76% from 2011's 3.94%. By contrast, BB&T's 4Q net interest margin stood at 3.84%, while for the entirety of fiscal 2012, it was 3.91%. Nevertheless, Wells' upticks in revenue and surges in net profit are the products of fine performance and sharp management. They're also putting more money back into the wallets of investors, another key reason the bank's stock has traded northwards of late. On the back of those (generally) happy 4Q figures, the company hiked its dividend by 14% to $0.25 per share this past January. This was less than a year after it nearly doubled its payout to $0.22. If there's one thing investors find hard to resist, it's a rising dividend. Very possibly, there will soon be more water coming from that pipe. In no uncertain terms, the bank's CEO John Stumpf said it intended to return more lucre to shareholders.Wells isn't entirely the master of its own destiny in this area (these days, it requires a nod from the Fed), but at the rate the company is going, it's hard to imagine that this won't happen. Mortgages will likely continue to be hot, given the improving macroeconomic climate and those skinny interest rates, so expect Wells Fargo to ride that prosperous road. And with the bank's good performance in the stress test, it seems likely the Fed won't take issue with its ambition to put more money in the pockets of its stockholders. So the present and the near future both look good, but investors should dig in to 1Q results -- scheduled to be unveiled in April -- to see how well the bank is keeping up the good momentum. Not to mention whether it'll manage to shore up that net interest margin. A big question at the moment, though, is whether Wells Fargo is still a bargain at its cranked-up price. Is there still room to buy, or is it time to cash in your gains? To help figure out whether the stock is a buy today, consider downloading our essential premium research report from one of The Motley Fool's top banking analysts. Click here now for instant access to this in-depth take on Wells Fargo. The article Can This Monster Bank Rise Above Its 52-Week High? originally appeared on Fool.com. Fool contributor Eric Volkman has no position in any stocks mentioned. The Motley Fool recommends Wells Fargo. 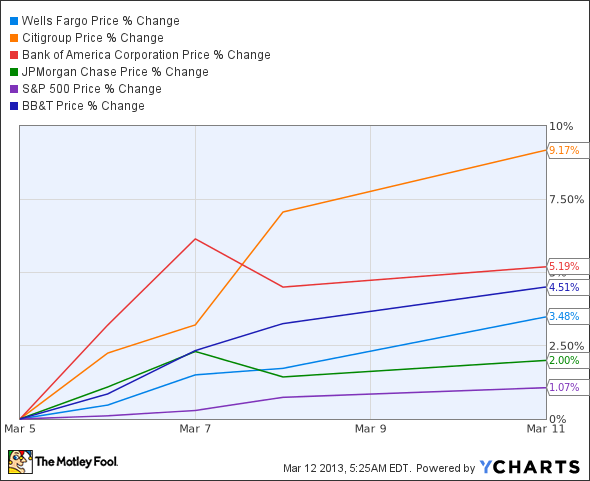 The Motley Fool owns shares of Bank of America, Citigroup, JPMorgan Chase, and Wells Fargo. Try any of our Foolish newsletter services free for 30 days. We Fools may not all hold the same opinions, but we all believe that considering a diverse range of insights makes us better investors. The Motley Fool has a disclosure policy.